Al-Zarqali, also called Arzachel in the West, was an early Muslim polymath from Spain – an astronomer and engineer – whose discoveries and inventions influenced a number of Islamic and European scientists, like Johannes Kepler and Regiomontanus. Al-Zarqali was one of the several great scientists produced by Islamic Spain. He advanced the study of astronomy through his extensive observations. He stated that Planetary Orbits are elliptical and not circular. He was also a mechanical engineer and maker of precision instruments. His public water-clocks and advanced astrolabe have been highly admired. He belonged to a family of craftsmen who made several mechanical devices and inherited his family skill. Staying at Qurtuba (Cordoba) until he completed his education, he then moved to Talita (Toledo) where he entered the service of its Sultan al-Ma’mun. His job was to make instruments for the astronomers of al-Ma’mun who were engaged in a major research project on astronomy. With hard work and by virtue of being highly talented, he soon became the director of the project. He spent a long fruitful year at Toledo, where he conducted extensive observations, made mechanical devices and astronomical instruments, and wrote a number of books. His water clock of Toledo attracted huge attention. Jewish scholar Moses ben Ezra wrote a poem about it. Leaving Toledo in 470 AH/ 1078 CE when it was repeatedly attacked by Alfonso VI, Al-Zarqali went to Cordoba where he continued his research. Al- Zarqali wrote several books on astronomy and astronomical instruments and the most famous of his books is the Toledan Tables. It deals with various aspects of astronomy, like the determination of the right ascensions, the equation of sun, moon and planets, ascendant, parallax, eclipses, the setting of planets, theory of trepidation, tables of stellar positions, trigonometrical tables etc. The Toledan Tables was translated into Latin by Gerard of Cremona (d. 1187) and was highly popular in Europe and in the Islamic world. His other works were also translated into Latin and Hebrew from the twelfth century onwards. In fact, some of his works are preserved in their Latin versions only, the Arabic originals having been lost. He influenced a number of Islamic and European scientists, like Johannes Kepler and Regiomontanus. Al-Zarqali stated that the orbits of planets are elliptical (and not circular) five centuries before Kepler (d. 1630). He established that, with reference to stars, the solar apogee is variable. He determined the longitude of the Regulus; presented improved trigonometrical tables of sines, cosines, versed sines, secants and tangents; calculated the obliquity of the ecliptic at between 13.13” and 13.5”; presented the stereographic projection of the sphere on a plane etc. 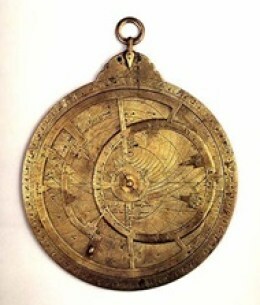 Al-Zarqali constructed an advanced version of the astrolabe used in Europe for a long time as Sphaea (from al-Sahifa). His two public water clocks set up at Toledo evoked great admiration. They consisted of a precise lunar calendar and two vessels which gradually filled while the moon was waxing and emptied as the moon waned. They were fore-runners of the clocks and planetary calendar machines of the seventeenth century Europe. The clocks were in the use until 1133 when they were dismantled by orders of Alfonso VII to find out their workings but could not be restored. Rockets had been used in warfare since the 13th century. The Chinese had used them to defend themselves against Mongol invaders, the Mughals frequently used them on the battlefield and the Europeans had started experimenting with them by the 15th century. However, these rockets were built with flimsy materials like cardboard and were not very effective in inflicting damage on the enemy, similar to modern-day firecrackers. Thus, their use as a weapon had been discarded in favour of cannons and other forms of artillery. It was the de facto ruler of 18th century Mysore, Hyder Ali, who developed the first prototypes of sturdier explosives-filled rockets. His innovation was further fine-tuned by his son Tipu who planned, designed and crafted cylindrical iron tubes that would allow for great compression of the filled gunpowder and consequently, greater range (nearly 2 km). Tipu then fastened them to swords or bamboo poles to provide stability, that would, in turn, lead to better accuracy. 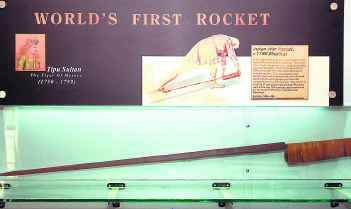 Thus, the predecessor of the modern rocket was born. It had a greater range, better accuracy and a far-more destructive bang than any other rocket in use, making it the best in the world at that time. 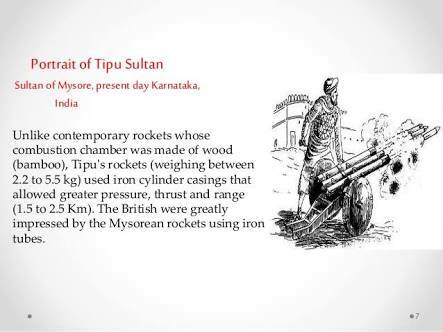 During the Anglo-Mysore wars of the late 1700s, Mysorean rockets were used by Tipu to great effect. Especially during the Battle of Pollilur (the Second Anglo-Mysore War in 1780), when a devastating barrage by Tipu’s rocket corps set fire to the East India Company’s ammunition dumps to hand the British army one of its worst ever defeats in India. Utilizing the advantage provided by the superior quality of hammered iron available in Mysore, Tipu also established four taramandalpets (that translates to ‘star-cluster bazaars’) at Srirangapatna, Bangalore, Chitradurga and Bidanur (present-day Nagara in central Karnataka in India) to conduct research on rocket technology. At this medieval tech parks, craftsmen-turned-rocketmen (called jourks) conducted experiments to improve the iron casting, accuracy and range of the rockets. Furthermore, they were taught basic calculations to help them fine-tune launch settings that would allow rockets of different sizes and weights to hit targets varying distances and elevations. For instance, wheeled carts were fitted with multiple rocket ramps so as to allow the rocket artillery brigades (called cushoons) to launch about a dozen missiles at a time. The many encounters in the 1700s between the colonial army and Tipu’s rocket corps also formed the basis for many interesting anecdotes. Here’s how one of them about Arthur Wellesley, the famous British hero of Waterloo. In 1799, Wellesley (the Duke of Wellington) was on reconnoitering mission in an areca nut grove (near Srirangapatana) when he found himself under attack. Having never encountered Tipu’s rocket fire before, he was scared silly by the ferocious barrages and ran away from the scene. Later, he was so abashed by his behavior that he promised himself that he would never show fear on the battlefield again. With time, he famously came to be known as a man who could not be rattled by anything. So, the Iron Duke’s spine of steel was actually forged in Srirangapatna! Interestingly, APJ Abdul Kalam was fascinated by Srirangapatna’s historic connection with modern missiles. During his tenure as President, he was keen on preserving the Rocket Court (the laboratory where Tipu tested his rockets) and developing it as a museum — an idea that found mention in his book ‘Wings of Fire‘. At his behest, DRDO scientist Sivathanu Pillai (who later headed Brahmos Aero Space) visited the ruins to study the site. However, work is yet to begin in this regard. As for the Mysorean missiles, after the fall of Srirangapattana in 1799, the British army found 600 launchers, 700 serviceable rockets and 9,000 empty rockets at Tipu’s fort. Many of these were sent to the Royal Artillery Museum in Woolwich (where two specimens are still preserved), inspiring it to start a a military rocket research and development program in 1801. It was here that William Congreve started studying them and did some fine reverse engineering to invent the Congreve rocket (it had collapsible frames for launching). In a quirk of fate, it was Iron Duke Wellesley who would go on to use these Congreve rockets systematically against Napoleon and defeat him at Waterloo in June 1815. Today, there is not much left in Srirangapatna (India) to stand testimony to one of the most interesting technological episodes in Indian history. The mark of Mysorean rockets on world military history, however, remains indelible.